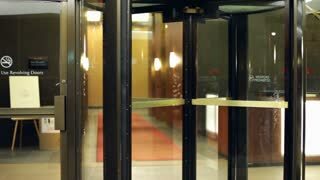 Search Results for "revolving door"
Top view on young businesswoman or female manager going to work in office through the revolving door, using smartphone. A group of Asian students walk out of the university library chatting and smiling before entering a revolving door. Happy young men and women leaving the college library. TRACKING SHOT. Abstract reflection of city life in an office window. 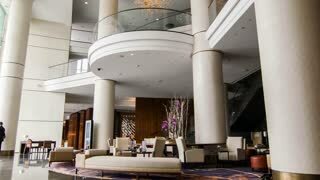 Commuters, buildings, a revolving door, can be seen reflected, office chairs and ceiling lights inside. 1960s: Kids walk through revolving door into pretend bank. Couple walks down pretend street, walks into bank, sits down at desk with bank employee. Kids deposit money with bank teller. 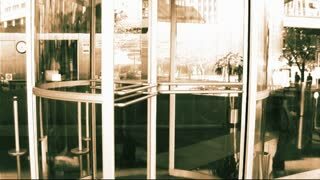 1970s: People walk through revolving door. 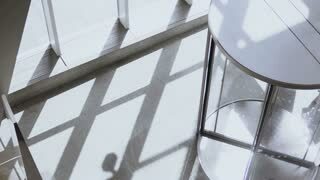 People sit at conference table. Man talks. Office. Men work in hole on city street. 1940s: Customers enter restaurant through revolving door. Manager thinks and writes in office. Woman pulls covered dish from oven. 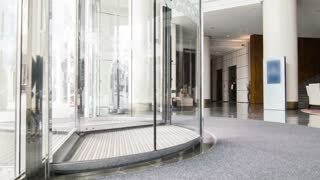 Revolving door in a modern building with traffic reflected in glass windows. DUBAI, UAE - 2013: Shoppers entering through revolving doors at Dubai Mall March, 2013 in Dubai, United Arab Emirates. Dubai Mall is one of the largest mall in the world.